Burnley celebrated boss Sean Dyche's new contract by beating leaders Hull City to close within a point of them. Both teams had first-half openings, with Clarets defender Michael Keane twice unable to keep headers on target, while Hull's Robert Snodgrass failed to beat Tom Heaton with a volley. Moses Odubajo forced another save from Heaton at the start of the second half. Tigers keeper Allan McGregor spilled Joey Barton's shot to Sam Vokes and he kept his cool to slot home the rebound. The result meant the third-placed Clarets are one point behind both the Tigers and Middlesbrough, but have played more games than both. Hull hammered Dyche's men 3-0 when the two sides last met on Boxing Day, but a repeat of that never looked likely with the hosts deserving their narrow win. Barton came close to opening the scoring after half an hour when his skidding free-kick forced a low save from McGregor before the keeper denied the same player from a header. The pivotal moment in the game came in the 77th minute when Wales international Vokes reacted quickest to McGregor's save from another Barton effort. Hull substitute Chuba Akpom had a shot saved but he could not prevent his side suffering a first defeat since 28 December. "I always knew it was going to be tight, but looking back I think we controlled the quality of the game overall. "Hull are a very strong defensive side with a real depth of experience, but we've managed to breach them one more time than they breached us. "We're right up there in the hunt, but nothing will be decided yet." "There was loads of heart and endeavour out there, and that from two top-class teams. It was never going to be a classic in weather like that. "We carved out some great chances, but maybe we just missed that killer instinct in front of goal that you need. "We've lost, but you just have to accept the result and move on. And we will do. "We've played well in really difficult conditions. It's been an opportunity missed for us to create a bit of daylight at the top, but I couldn't fault the players." Corner, Burnley. Conceded by Allan McGregor. Substitution, Hull City. Tom Huddlestone replaces Jake Livermore. Offside, Burnley. David Jones tries a through ball, but Sam Vokes is caught offside. George Boyd (Burnley) wins a free kick in the defensive half. Sam Vokes (Burnley) has gone down, but that's a dive. Attempt blocked. Andre Gray (Burnley) right footed shot from outside the box is blocked. Assisted by George Boyd. Goal! Burnley 1, Hull City 0. Sam Vokes (Burnley) right footed shot from the centre of the box to the bottom right corner. Attempt saved. Joey Barton (Burnley) right footed shot from outside the box is saved in the centre of the goal. Substitution, Hull City. Sone Aluko replaces Mohamed Diamé. Attempt missed. Abel Hernández (Hull City) header from the centre of the box is just a bit too high. Assisted by Sam Clucas with a cross. Attempt missed. Matthew Lowton (Burnley) right footed shot from outside the box misses to the left. Assisted by Joey Barton with a headed pass. Attempt missed. Jake Livermore (Hull City) right footed shot from outside the box is close, but misses the top right corner following a corner. Corner, Hull City. Conceded by Matthew Lowton. Attempt blocked. Isaac Hayden (Hull City) left footed shot from the left side of the box is blocked. Corner, Hull City. Conceded by Scott Arfield. Offside, Hull City. Michael Dawson tries a through ball, but Abel Hernández is caught offside. Attempt saved. Abel Hernández (Hull City) left footed shot from the left side of the box is saved in the centre of the goal. Assisted by Robert Snodgrass. David Jones (Burnley) wins a free kick in the defensive half. Attempt missed. 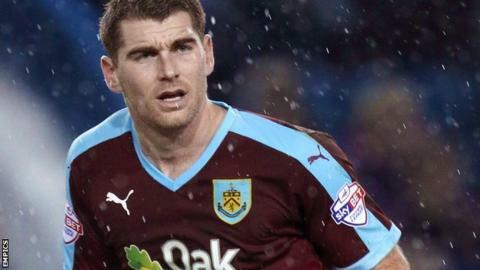 Sam Vokes (Burnley) right footed shot from more than 35 yards misses to the left. Assisted by Michael Keane. Corner, Hull City. Conceded by Tom Heaton. Attempt saved. Moses Odubajo (Hull City) left footed shot from outside the box is saved in the top left corner. Assisted by Sam Clucas. Dangerous play by Andre Gray (Burnley). Attempt blocked. George Boyd (Burnley) left footed shot from the centre of the box is blocked.